Birmingham sprinter Mark Lewis-Francis is confident that he can make up for lost time this season as he continues his recovery from a groin injury. Lewis-Francis suffered the problem while competing in front of his home fans at the Aviva Grand Prix meeting in Birmingham in February. "I'm still high in spirits. I'm still confident," Lewis-Francis told BBC WM. "It was a bitter blow, but that's what track and field is all about, taking the highs with the lows." 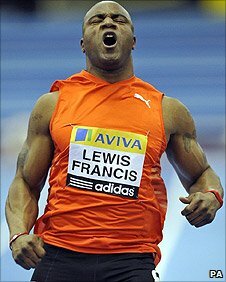 Lewis-Francis anchored the British 4x100m team to Olympic gold in Athens in 2004, but missed the Beijing Games through injury and is desperate to make the team for London. "A lot of people said to me that the injury is a blessing in disguise," said Lewis-Francis. "If it happened midway through the 2011 season, it would have been more effective on 2012 and the upcoming season. "My body needed a rest. It's just telling me something, that it needed a rest, and to get ready for the outdoor season. "I had a long season last year. I finished my season in October. "Normally, I would take a month off, but I took 10 days off and then went straight back into training. That's how the injury occurred, not resting my body enough. "I've had five weeks with a bit of training, but I've toned it down a lot, just to make sure my injury recovers the best way. But I've got a lot of time. "It's a long season this year. We don't have the trials until the end of July and the World Championships aren't until the end of August. "I'm confident that I'll be back, and I'll be stronger than I was before. "I'm off to warm weather training. It's an opportunity to get my head down to catch up on the weeks that I've missed so far in training. I'm still high in spirit, I'm still confident."